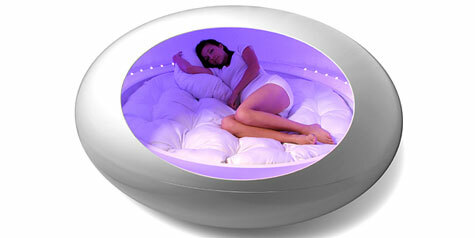 Designer Alberto Frias developed the Transport, an egg-shaped vessel made from fiberglass that is outfitted with a couple of subwoofer speakers and an array of LEDs to provide the working class with a means of escape from the stress-filled world in which we live and work in. The Transport looks like what some would call a personal miniature planetarium, featuring a central cushion for you to lie back and throw away the cares of the world if but for a moment. Flickering bright lights will be display in harmony to the music played, and Mr. Frias hopes that will encourage the occupant to feel one with the cosmos.